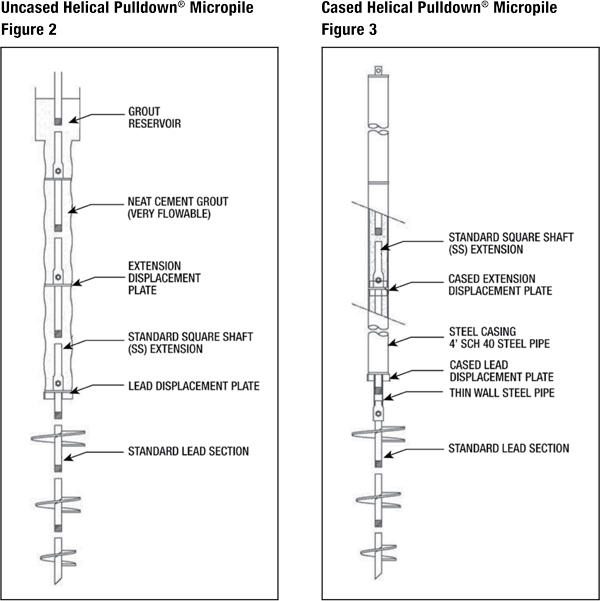 The Helical Pulldown Micropile (HPM) is used to form a grout column around the shaft of a standard helical anchor/pile. The installation process can employ grout only (see Uncased Helical Pulldown Micropile) or grout in combination with either steel or PVC casing (see Cased Helical Pulldown Micropile). To begin the process, a AB Chance helical anchor/pile is placed into the soil by applying torque to the shaft. The helical shape of the bearing plates creates a significant force that keeps the foundation advancing into the soil. After the Lead Section with the helical plates penetrates the soil, a Lead Displacement Plate and Extension are placed onto the shaft. Resuming torque on the assembly advances the helical plates and pulls the displacement plate downward, forcing soil outward to create a cylindrical void around the shaft. From a reservoir at the surface, a flowable grout immediately fills this void surrounding the shaft. Additional extensions and displacement plates are added until the helical bearing plates reach the minimum depth required or competent load-bearing soil. This displacement pile system does not require removing spoils from the site. It's considered an economical deep foundation solution. For more information, please fill out our form to contact one of our helical pile installation specialists.